At least one of the figures in this photograph from the Crystal Bridges Museum of American Art is a sculpture, but how many? 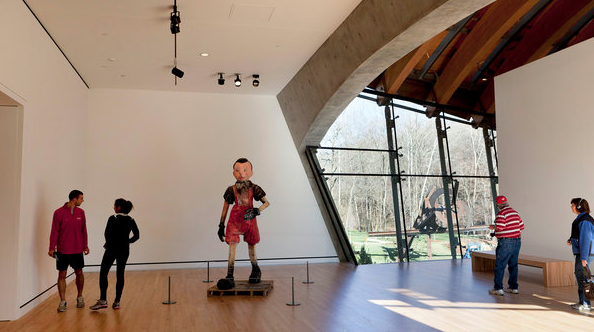 Jim Dine‘s “Walking to Boras” occupies the center of the display space. The pedestal and the four short poles for the ropes to prevent contact assure us that it is an objet d’art, just in case you had any doubt about a seven foot boy in lederhosen. But what about the two figures on the left? They are so perfectly caught in time, and so gracefully posed in a moment of dynamic equilibrium, and so absolutely isolated in visual space, where they are at once almost together and yet completely separate, and both specific individuals and social types. . . . The composition seems too good to have happened naturally, while it could be the real point of a larger composite grouping. We look for the statue contrasted with the people around it, only to discover that the artist has tricked us into seeing statues as people. Perhaps in the next millisecond the couple leaned into one another to confer or confide or otherwise get closer together, or perhaps a brief word or glance was enough to break the pause and they vectored off along the paths each was on, going in opposite directions in more ways than one. Or perhaps they are still there, perfectly posed in a moment of aesthetic perfection, but of course inert. But if they have moved on, what about the two figures on the right? They certainly could qualify at statues, as their all too ordinary clothes and postures echo the sculptures of George Segal. And it would be a good joke, not to mention a moment for genuine reflection, for a museum in the Ozarks to feature its most local visitors as works of art. And what if everyone in the room was a thing, a statue rather than a person passing through the aesthetic space? Would the space become less welcoming or more stimulating? More an occasion for reflection on art and life, or a disturbing walk through an uncanny valley of simulation? Questions such as these are prompted by the photographer’s superb ability to recreate the deep experience of the aesthetic encounter as it is available in any well-designed art museum. Stated more simply, a good museum, like the art it holds, brings the spectator not only to see the artworks as they are, but also to see everything else aesthetically. Nor need there be one definition or purpose for this kind of perception. However it works, the result can be to see more of what is there to be seen, and with more clarity, insight, objectivity, empathy, humor, desire, and respect. We can see how others are at once alien and human, typified and unique, needy and mindful, beautiful and doomed, achingly desirable and hopelessly out of reach, inhabitants of alternate worlds and caught in our shared catastrophe, exposed by the surface of things and forever unknown. A good museum does that. Photographs can do the same. Photographic space can work like museum space: tuning the senses to see the artistry in ordinary life. Admittedly, “museum” can be a ponderous word, heavily institutional and easily denigrated: “The real art is in the streets, not hanging on museum walls!” But photographic space can seem too small by itself, and the artistry of the photographic encounter is in fact nothing less than entering a dedicated space for seeing anew. And besides, much of the time photography already is in the streets. The relationship between photography and the fine arts has a rich history, including early modernist avant-garde movements such as surrealism and Dada, use as a muse by major painters such as Francis Bacon and as more than that by photo-realists such as Chuck Close and Cindy Sherman, late modern avant-garde movements such as pop art, and work by contemporary hyperrealists (and keep in mind that all such labels are only partially accurate). The photograph above was taken to accompany a New York Times review of the museum, and it serves that purpose well. It surpasses that assignment, however, to capture something profound about photography itself. Every photo of someone turns them temporarily into a statue. Doing so doesn’t kill them, but it can bring the rest of us to life. Photograph by Steve Hebert/New York Times.